The S.C. Department of Natural Resources (DNR) officially opened a regional Midlands office at the State Farmers Market on Jan. 29, 2016. The office is located at 326 Little Brooke Lane in West Columbia in the Market Pavilion. The public will be able to purchase hunting and fishing licenses, permits and tags, as well as renew watercraft registrations and obtain duplicate decals and registration cards. Most of these transactions take three to five minutes, making this an express office. Licenses and all boating transactions will still be available at the DNR headquarters at the Dennis Building at 1000 Assembly Street in Columbia. 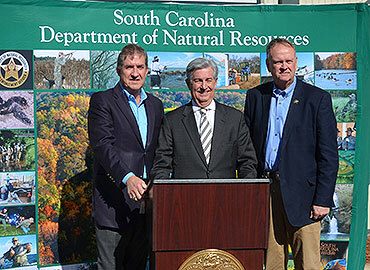 "I just want to say thank you to the South Carolina Department of Natural Resources and the South Carolina Department of Agriculture for coming together and providing this service to the citizens of this state, particularly to the Midlands," said Senator Nikki Setzler. "Just to have the parking we are going to have here is a tremendous asset. I want to welcome them to Senate District 26." The lack of parking at the Dennis Building has created a significant problem for DNR constituents and the new State Farmers Market location will provide plentiful parking and shorter transaction times. "We believe this will create a much better experience for the public," said DNR Director Alvin Taylor. In addition to the express service, DNR patrons can also visit the Certified S.C. farmer sheds or enjoy a meal at Dupre at the Market, also located in the Market Pavilion. Visitors to the market can enjoy local produce as well as other seasonal offerings like pumpkins, Christmas trees and watermelons. A Fresh on the Menu restaurant, Dupre at the Market features daily specials and Southern favorites like pimento cheese, fried okra and meatloaf. "We are very excited about our partnership with DNR. Our State Farmers Market is the perfect location for hunters and boaters to renew their licenses with shorter wait times and without the hassle of downtown parking. I hope that customers will also take the opportunity to see what our market has to offer," said Commissioner of Agriculture Hugh Weathers.